← How to customize option of PDF invoice for adding text multiple lines? Question:Cannot view XPS file inside iframe. If iframe is expanded than file shows up. This only happens on windows XP and works fine on Windows 7. In our application we display many different file types. One of them is XPS. If iframe window is big enough it displays fine but I make it smaller than I get the errors. So I thought is there any solution on VeryPDF? Answer: According to your description, maybe you can have a free trial of this software:VeryPDF Free Online Document Viewer. This free online application allows you to view XPS inside iframe without file size limitation as you can adjust view options according to the iframe parameters. Meanwhile this online application is not limited by computer system. It works through browser, so there should not have any problem under windows XPS. 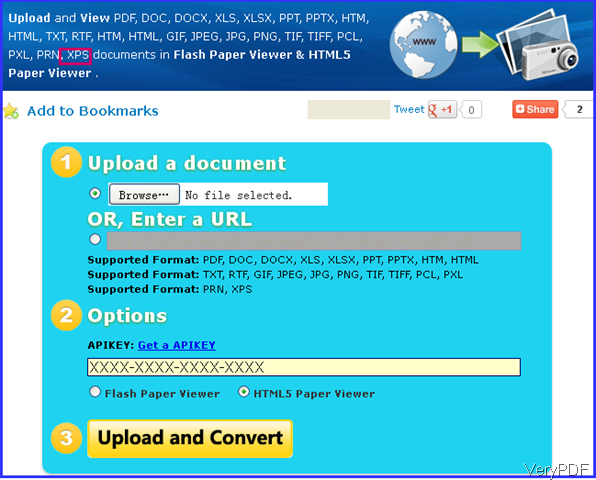 This application also can help you display many different file types like PDF, DOC, DOCX, XLS, XLSX, PPT, PPTX, HTM, HTML, TXT, RTF, HTM, HTML, GIF, JPEG, JPG, PNG, TIF, TIFF, PCL, PXL, PRN and others. When you use it no matter in computer or cellphone, there should not have any problems. Please check more information on homepage, in the following part, let us check how to use this software. The following snapshot is from this software website, please have a check. All you need to do is that upload local XPS file to this website by clicking button Browse—> Input the API code if you need to save the embed code in iframe longer than 24 hours.—> choose HTML 5 paper viewer if you need to display XPS without Flash player installed. Meanwhile this option can help you view XPS file under Android system like cellphone or iPad. –> then click button Upload and Convert. The iframe code of viewing XPS will be shown in another tab. Step 2. View XPS in iframe without size limitation. When you click button Upload and Converter then you will enter another tab where you can get iframe code. 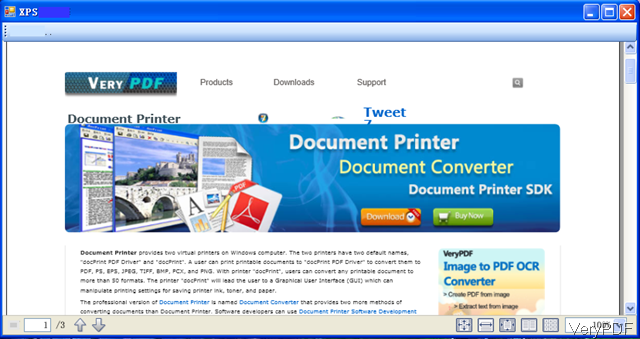 This free online application will convert XPS to PDF and then show iframe code. In the iframe code, you can adjust width and height. The following message is from the iframe code, please have a check. You can adjust size within iframe. By the iframe code, you can embed it at any website then view it normally. I embed it here, please have a check. The following snapshot is from XPS viewer, you can compare the showing effect. How to view XPS file on Android system? This entry was posted in VeryPDF Cloud API and tagged view XPS. Bookmark the permalink.